My 21 year old daughter is studying art and we made this a "mother-daughter" trip to expose her to Renaissance art and architecture. The guide was well informed about the David and certainly enhanced the visit to the Accademia Gallery. We also enjoyed viewing the old instruments on display. Really enjoyed this tour! Our guide was educational and entertaining, and it was a life saver to skip the long lines into the gallery! I booked the wrong date in error and they contacted me and very kindly changed my reservation to the time that worked for us. it is a great trip and nobody should miss David in person. highly recommend. Great tour, would highly recommend. Our guide, Daniela, was very knowledgeable and helped us appreciate what we were seeing beyond what we would on our own. She was also very kind and fun. Well organized and structured tour. Really enjoyed it and apreciated our guide. This tour was amazing. We had a great guide, and a very small group. David. What more can you say? Alwasy do skip the line even if you think no one else will be there- they will. Did this in April 2017 with a friend, guide was very knowledgeable. Our guide, Danielle (hope I spell her name correctly), is very knowledgeable and gave a detailed explaination of the history behind the important art pieces. Even my eleven year-old child enjoyed the tour with Daynielle’s lively explanation. Very good tour with knowledgeable guide who ensured we saw the best the gallery had to offer. 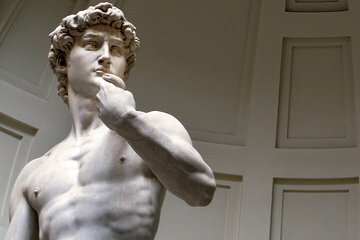 You have to go to see David but not sure if one needs a guide. The tour finished early and we felt the guide had other plans.